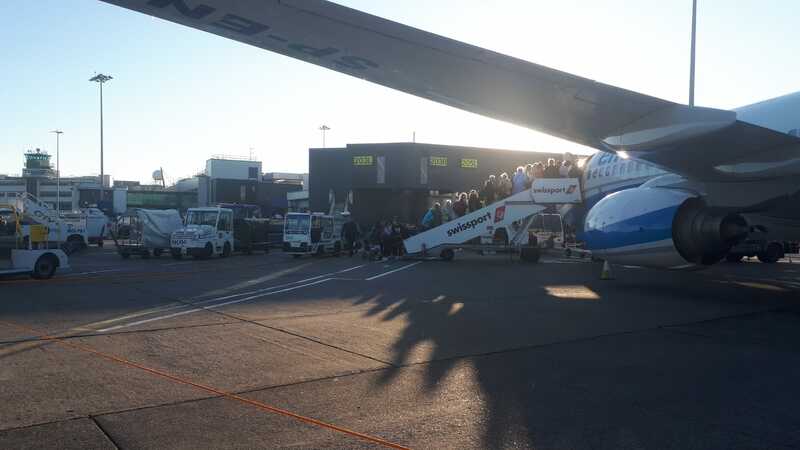 “We woke up to a beautiful sunny day and ate breakfast at around 7.30. We found it so hard to believe that it was our final day in this remarkable place. We headed to do our duties with three of us on wards and two of us on reception. For those of us on wards we started about cleaning our pilgrims’ rooms for the last time. We then headed to the baths with the pilgrims who wanted to avail of them. It was an extraordinary experience for them with some feeling a notable change in themselves afterwards. Following this, the pilgrims had free time both before and after lunch. Some people spent this time packing or buying some last minute gifts for friends and family in the town. We even found time to do some shopping, buying 200 medals for sixth year students and teachers in our school. At around 4.30 our Farewell Mass took place. It was a lovely service where the Archbishop blessed all of the presents everyone had bought during their time on the pilgrimage. When everybody had finished their dinner it was party time. We danced, sang and cried together at what was the last organised event with our pilgrims. We shared gifts that we had bought for them. It was a wonderful way to end the time we had shared with them. As the party began to finish up, we prepared to bring our pilgrims back to their rooms for a final night. We said goodbye to everyone and even helped with some packing in the process. 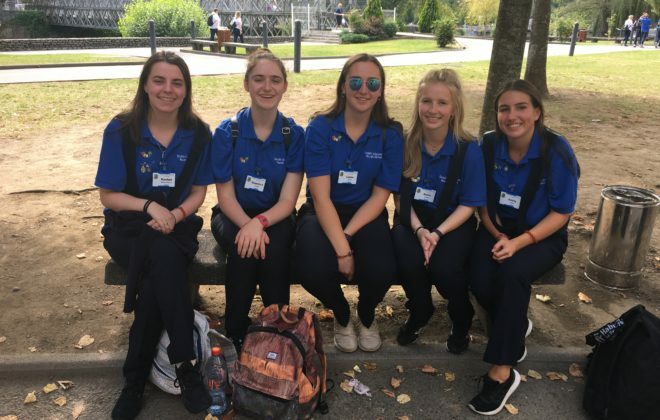 It was a very emotional experience as we are definitely going to miss everyone, however, our moods were uplifted by the thought of returning next year. 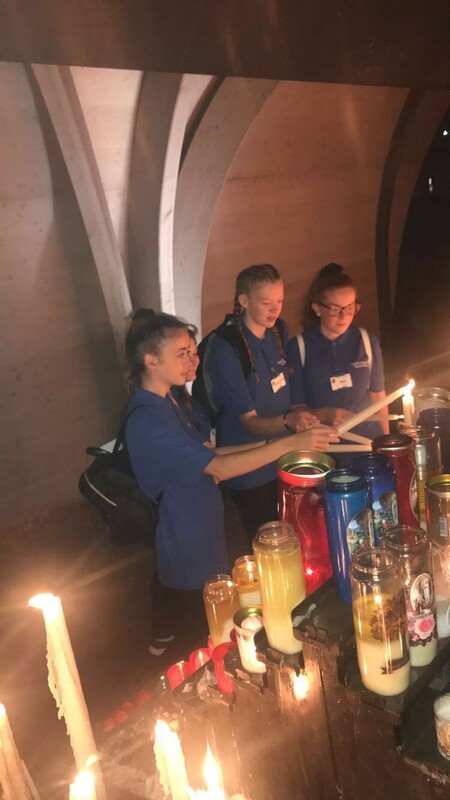 Leaving the Accueil for the last time and armed with our school candle, we made our way to light it. We prayed for everyone, especially our pilgrims and the students in our year. Prairie followed this and centred on the theme of thanks giving. We then stopped off at the Grotto to drop our petitions in. 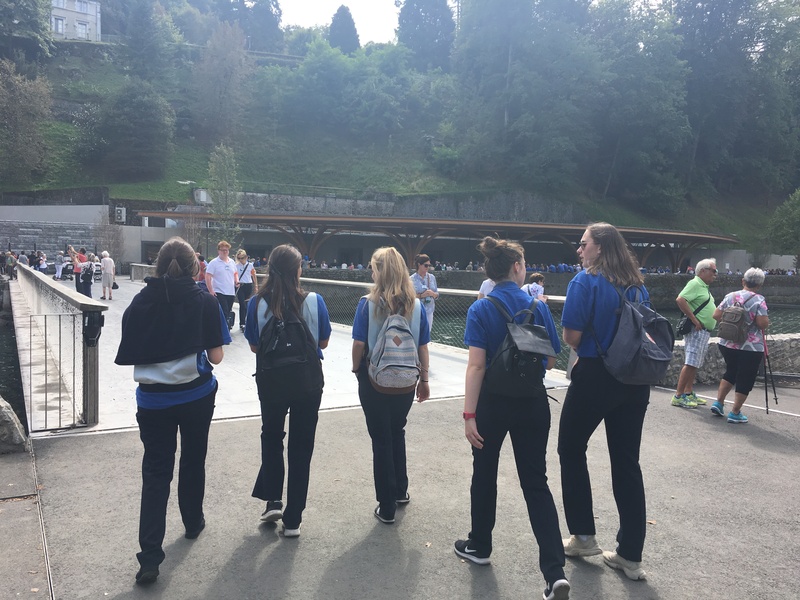 The peace and tranquillity there really helped us to reflect on our time in Lourdes. 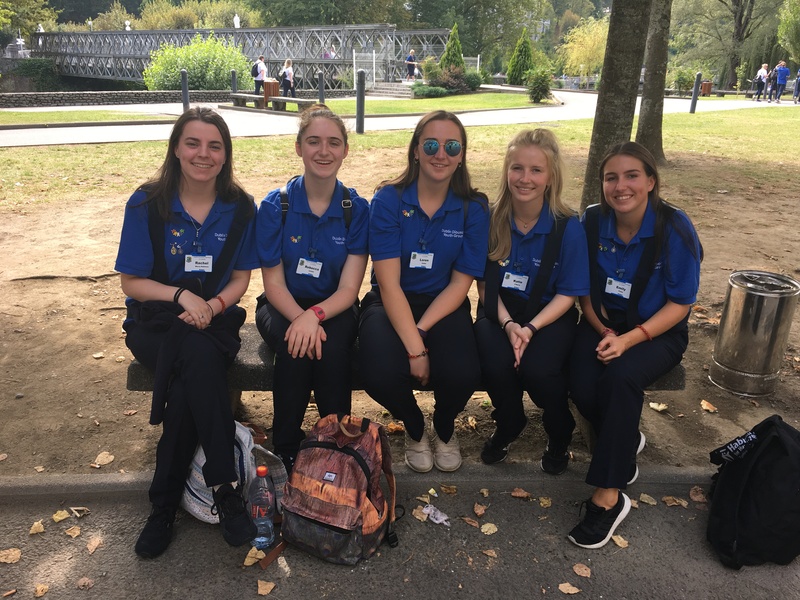 “Day four in Lourdes was a day to remember. The duties we have been assigned for the pilgrimage are Stewarding/Function Control and Hotel Support. Stewarding involves directing people to the different events and parking voitures and wheelchairs during liturgies, so we were very busy preparing for this morning’s penitential service. Our students on hotel support called to all the nearby hotels to offer assistance to bring pilgrims to the church. The penitential service was a chance for pilgrims and helpers to receive the Sacrament of Reconciliation. When we have free time we love to go to meet the pilgrims on the wards in the Accueil. We got the opportunity to do this today before lunch. After lunch came one of the most important parts of the pilgrimage: The Mass for the Anointing of the Sick. This was followed by a procession through the Grotto. The pilgrims sat outside for tea and biscuits in the late afternoon so we spent time chatting to them and hearing their stories. At this time some of the other blue shirts attend the baths. We got to have this experience yesterday and it’s one we’ll never forget! When we were finished our duties we went shopping for souvenirs to bring back to our school and families. 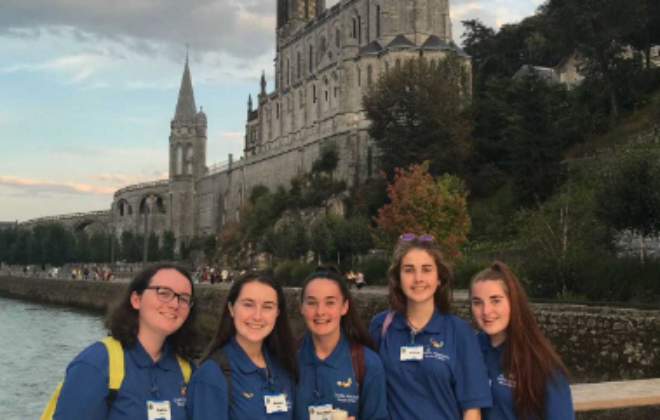 After dinner we were proud to watch our teacher and nine Loreto Abbey Dalkey past pupils receive bronze and silver medals for three and five years’ service to the pilgrimage. We all hope to receive medals in the coming years. One man was presented with a special award for sixty years’ service! We then had Prairie to reflect on the “awesome” day. Tonight the white shirts led us in a sing-song in the Solitude Hotel. We sang and danced the night away while the pilgrims slept in their beds. “The Youth Mass took place at 10:30 this morning. There was a procession into the church lead by flags for the Blue-shirts. We all sat down together and enjoyed a Mass that was full of joyous singing and reflection. Fr. Paul and Fr. Séan gave a wonderful homily and everyone joined in for the hymns. It felt like we were all connected and it was nice to know that we were helping other people, instead of thinking of ourselves all the time. This morning I arrived to clean the pilgrims’ rooms while they had a lovely breakfast of cereal, porridge and toast. They were all in great spirits after a great night’s sleep and were ready for a chat. 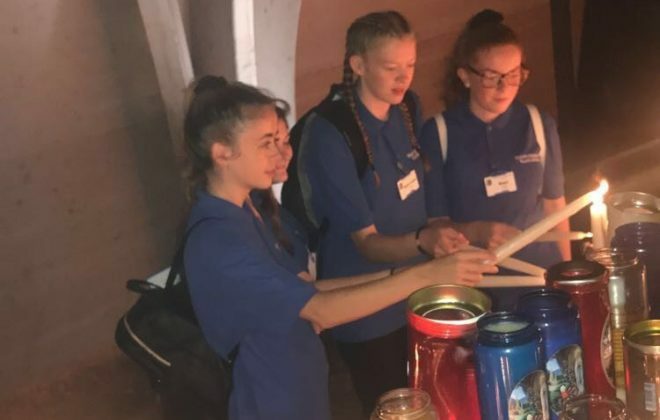 We then headed to the Youth Mass and after came back for a lovely lunch and more chats, then it was time for the picnic, dinner and torch light procession which all the pilgrims in my ward thoroughly enjoyed. “Today was a very busy day for us. First, we had to get up early to go to work in the ref (refectory). There we are all assigned a table. This means that we are responsible for all the VIPs (Very Important Pilgrims) who are sitting at that table. One of us works with members of the deaf community and they are teaching her sign language. She is loving it so much that she is now considering a career working with members of the deaf society. The rest of us are all enjoying her free lessons in sign language every evening! From the ref we rushed to the church for the Youth Mass as we all had jobs to perform during the Mass. This was one of the many special experiences we have had here. 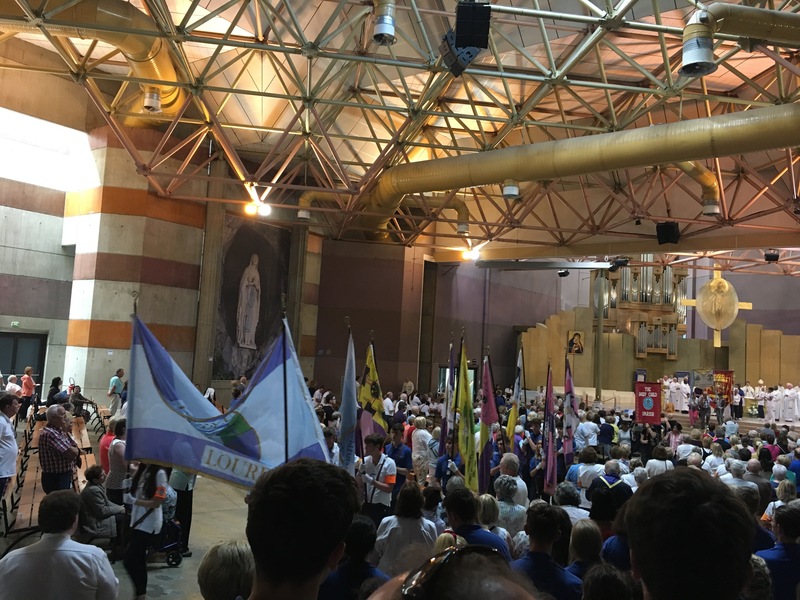 It was amazing to see the pilgrimage come together in such a beautiful way in the church. The singing was beautiful and the homilies of Father Paul and Father Sean found a special place in our hearts. We will remember for a long time their wise words about welcoming people who are different, about not being afraid of their differences. But also how it is important when we are feeling down, upset or anxious to think about people who are more in need than us and to try to help them. After the Mass, we got a quick photo taken with Archbishop Martin and ran back to the ref to work for lunch. In the afternoon, there was a picnic organised for our VIPs. We really enjoyed the singing and the dancing. Our VIPs can really teach us a thing or two about putting on a good show! After the picnic, we helped out in the ref for dinner. Then it was time for the torchlight procession. We were given special duties during the procession. We were part of a group of blue shirts who had to hold candles around Rosary square. We were told that this job was very significant as we would be the ones welcoming the pilgrims entering the square. These pilgrims might be going through a difficult time in their lives so it was very important for them to be met with a smile. It was magical to see all the candles and hear the singing of Ave Maria. We found it very moving at times. 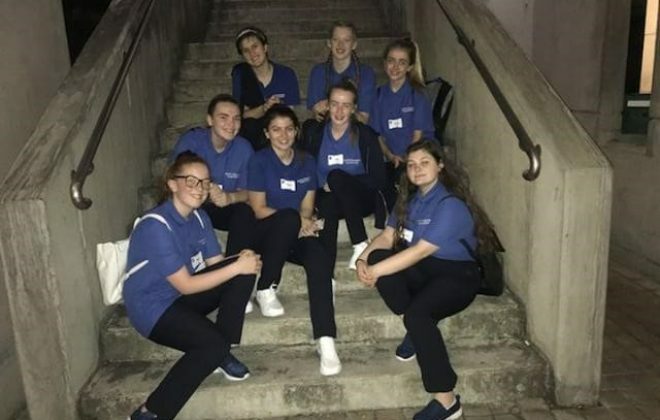 “Saturday was a busy day, as it was our first full day working in the pilgrimage and we didn’t know what to expect. We got up very early, had a quick breakfast and started off with our job in the refectory. This involves us helping out the pilgrims with whatever they need while they eat their meals. Some of us were assigned tables to sit at and some of us floated around ready to help. 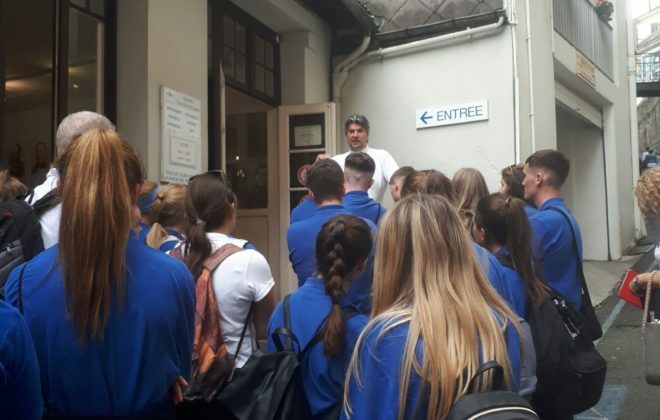 After breakfast, the whole Dublin Diocese pilgrimage had a Mass at the grotto, where the Archbishop spoke beautiful words of welcome to everyone from Dublin. This made us feel at home. After the Mass, we had the annual pilgrimage photograph. The photo only took a couple of seconds but gathering everybody into their positions took nearly half an hour. We really didn’t mind though because we were sitting in the sun and getting to know the other helpers and pilgrims. As we were working until the refectory, we had some free time today so we could go to the town and buy gifts for our families. We also bought some ice cream to help cool us down in the sun. However, the highlight of our day was the baths. We anxiously waited in the line, not knowing what to expect, but when we eventually went in we were soothed by the service. We went in one at a time, a woman stood around you with a body-length robe while you undressed. You then went inside where the bath was and your robe was exchanged for a wet towel that was tightly placed around our bodies, we said a short prayer and stepped into the bath. The water was ice cold so we were supported by two women either side. The women guided us to the statue of Mary, then helped us sit down so we were shoulder-deep in the bath. When we got out afterwards, we were astonished to see our bodies had dried after a couple of minutes. It was an amazing experience and we all came out smiling and chatting, asking others what they thought. Before prairie tonight, we walked down past St Bernadette’s Church to a beautiful area where we lit candles and said prayers for our families and friends at home. We placed these candles with many other candles and it was really pretty as it was also getting dark. This was an emotional time for us and the other people lighting candles around us. Then we went straight to prairie with the other students and teachers. 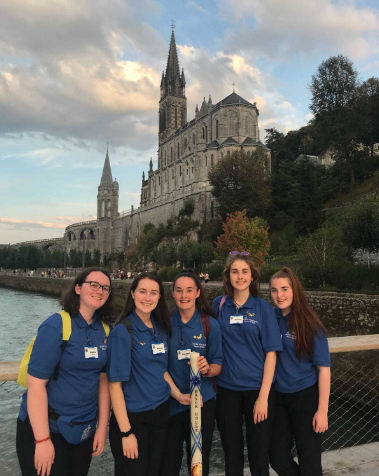 Prairie is a reflection time every evening for all the students helping out in Lourdes. 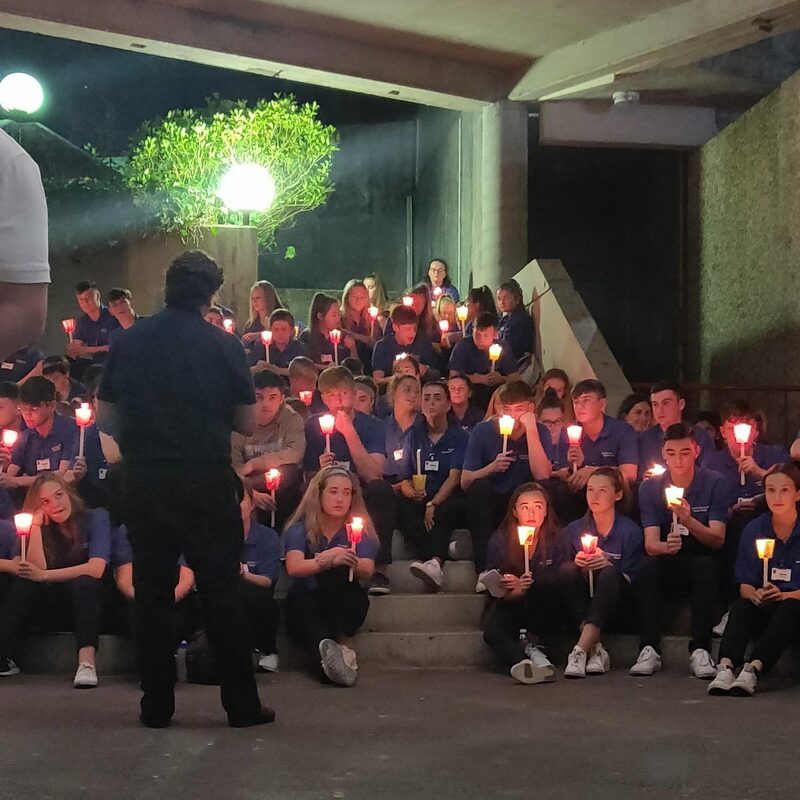 Everyone has a candle light and different groups perform a reflection every night. It was great to see the different talents that the other young people of Lourdes have. At the end of the night, we had a table quiz. 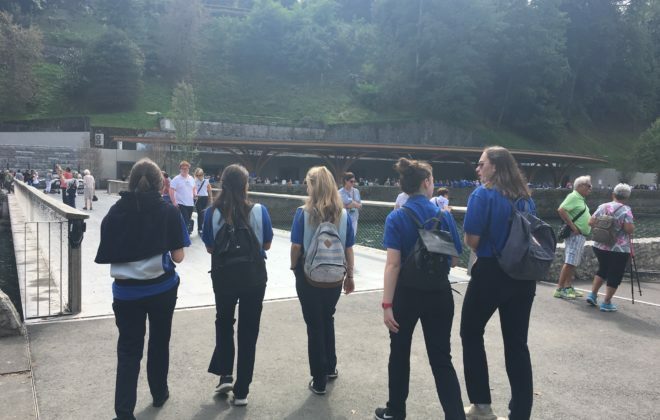 We really enjoyed this activity as we got to meet new people from other schools, as only two people from each school was allowed in each group. We got to chill out with our friends, although unfortunately none of our teams won! 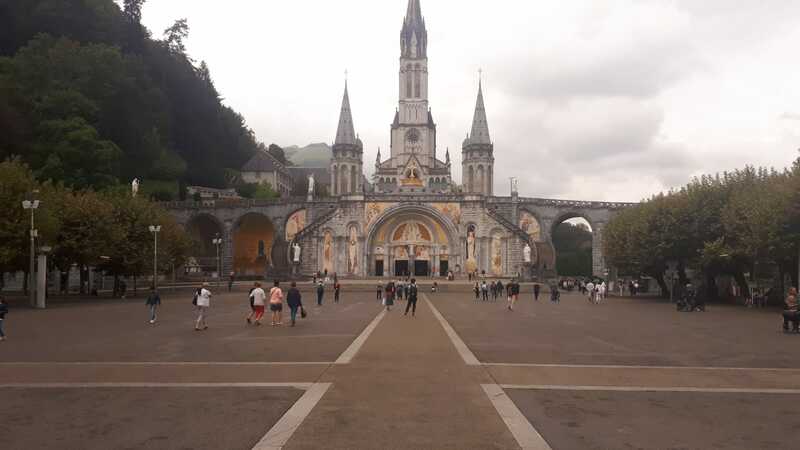 “After a long day yesterday of travel and preparing the Accueil for the sick pilgrims and their late arrival, we began our first official day of the Pilgrimage on the day of Our Lady’s birthday. After struggling (slightly!) to get out of bed, we began our duties on Ref down in the Accueil. This involved helping the sick pilgrims with breakfast. At 9.45, Archbishop Diarmuid Martin led us in the opening Mass at the Grotto. 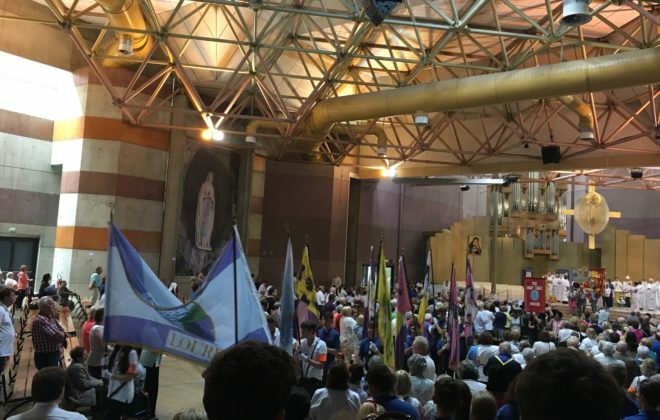 Over 2000 Dublin pilgrims packed in to the Grotto for a very moving Mass accompanied by beautiful music from the Diocesan Choir. 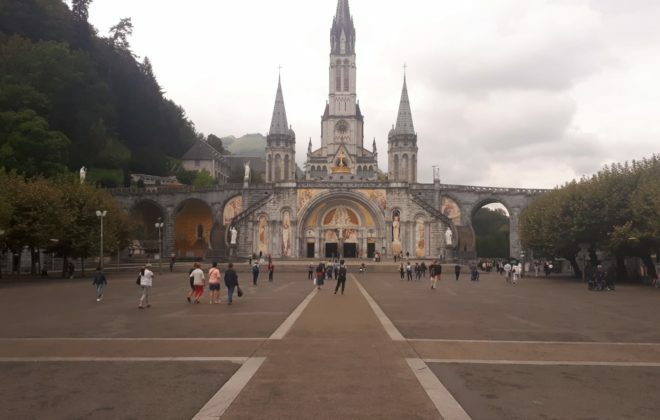 During his homily, Archbishop Martin reminded us that we were gathering in the remarkable atmosphere of peace and serenity that is the mark of Lourdes. It is a time for each of us to reflect on what is deepest in our hearts as believers. After Mass we all gathered on the steps of the Basilica in Rosary Square in blistering sunshine (definitely time for factor 50!). After lunch 12 of the schools presented the Stations of the Cross for the sick pilgrims on the Prairie opposite the Grotto. 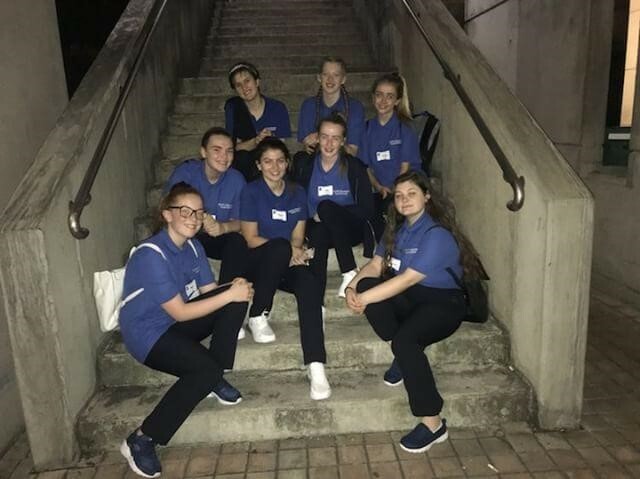 Both pilgrims and students found the stations a prayerful time out. Dublin led the Blessed Sacrament Procession at 5pm. The Procession ended in the Underground Basilica. A welcome relief to be in out of the sun. The Basilica was very impressive especially with the incense and music. At 9.30pm all the school groups gathered outside St Bernadette’s for our nightly Prairie with Fr Paul. This was led by four schools. We all held candles and looked across to the Grotto. The sound of the Torchlight Procession drifted in the background. “So far it has been an experience unlike any other and we hope that it continues like that over the coming week. 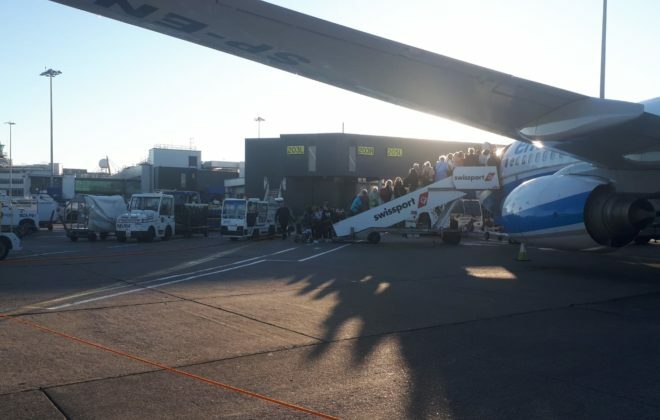 To start things off we arrived at Terminal 1 in Dublin Airport at 4:45am and we headed for our flight with the rest of the pilgrims. While we waited to depart we conversed with our fellow workers and began to make new friends among our co-workers and find common interested between us. 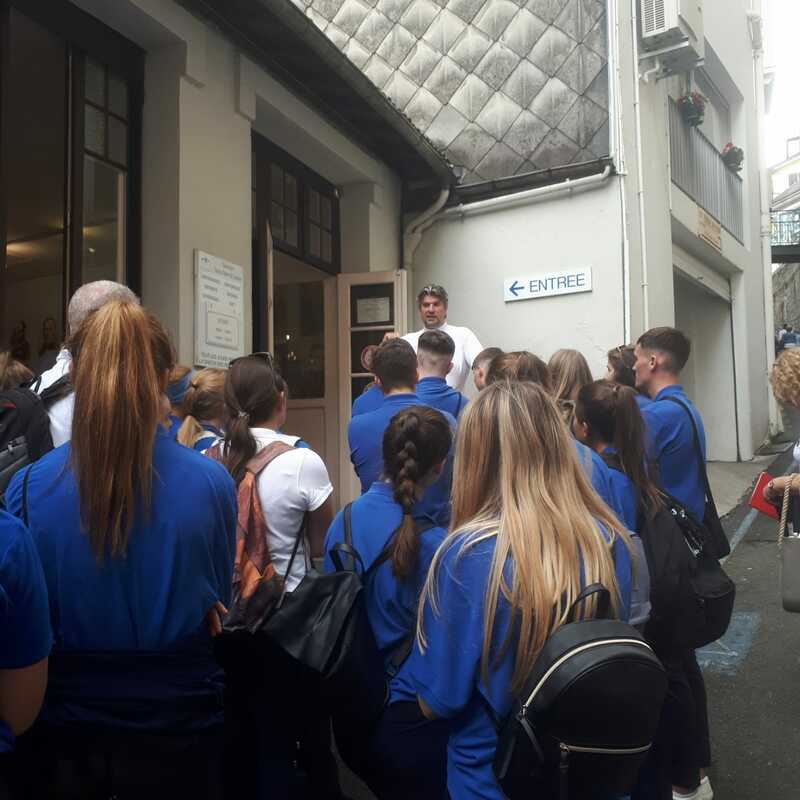 Upon leaving the flight we loaded our bags into a coach and headed for the Louis de France hotel in Lourdes. Upon arriving we got our room keys and were pleasantly surprised by the outstanding quality of our hotel room. After this we headed together to the Accueil for our training. We were working in the wards this time around, so we had both our basic training and ward training. This was extremely informative and interesting. After this we enter for our first Mass. It was a small and quiet Mass yet created a great sense of intimacy and time for silence. After this ceremony we enjoyed dinner back at the hotel and conversed with some of our seniors. The food was well-needed at this stage and was extremely satisfactory. Fully refuelling our energy and preparing us for the long and intense evening ahead. After dinner we returned to the wards and got a basic introduction to our coordinator and contact person. This allowed us some time to individually bond with our separate ward teams and get to know who we will be working with over the coming while. After this we assisted the white shirts in helping all the arriving pilgrims down to their wards for food and carrying their suitcases down to their rooms. Throughout, four white shirts played music to entertain both the pilgrims arriving and us working. This added a great buzz and atmosphere to the whole place. Finally after a long nights work we met with the whole group at the prairie. Here we took time to think of our hopes for the oncoming days and then walked in silence over to the river where we collectively said the Hail Mary, in hope that this would help our own personal hopes and the hopes of our co-workers. At this point the day was coming to a close. Tired and exhausted yet happy and satisfied we retired back to our hotels and got ready for a goods night sleep so we could jump right back into the swing of things tomorrow morning at 8am.